Archives of Eaton Bray News for March 2013. This article was published in March 2013. Please see Latest News for more recent information. This is a Neighbourhood Alert from Thames Valley Police, Aylesbury. A burglary has been reported on Good Intent, Edlesborough, between 10pm on Tuesday 26 and 3am on Wednesday 27 March. Offenders forced entry via a rear door and stole property including a 42" TV, mobile phone and a laptop computer. Det Con Emma Francis from Aylesbury Local CID would like to hear from anyone that might have witnessed any recent suspicious activity in the area. If you have any information please call Det Con Francis via the 24 hour Police Enquiry Centre number 101.
Who will you vote for on 4th April? A poll for the election of a Parish Councillor for Eaton Bray Parish Council will be held on Thursday 4 April 2013, between the hours of 7:00 am and 10:00 pm. The number of Parish Councillors to be elected is one. 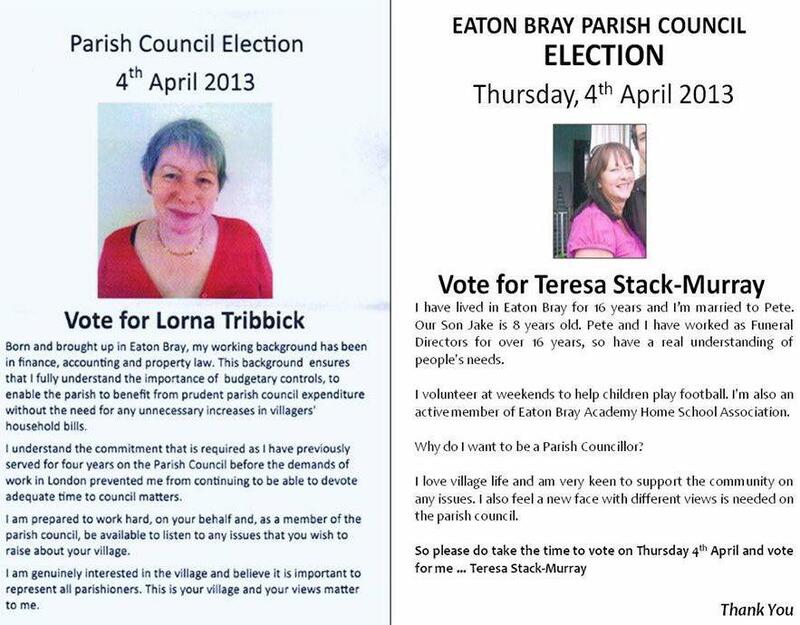 An Election is to be held of One Parish Councillor for Eaton Bray. Forms of nomination for the Parish Election may be obtained from Clerk to Parish Council or Priory House, Monks Walk, Chicksands, Shefford, Bedfordshire, SG17 5TQ from the Returning Officer who will, at the request of an elector for any electoral area prepare a nomination paper for signature. Nomination papers must be delivered to the Returning Officer, Priory House, Monks Walk, Chicksands, Shefford, Bedfordshire, SG17 5TQ on any day after the date of this notice but no later than NOON on Friday, 5th April 2013. If any election is contested the poll will take place on Thursday, 2nd May 2013. Applications, amendments or cancellations of postal votes must reach the Electoral Registration Officer at Priory House, Monks Walk, Chicksands, Shefford, Bedfordshire, SG17 5TQ by 5 pm on Wednesday, 15th April 2013. Applications to vote by proxy at this election must reach the Electoral Registration Officer at Priory House, Monks Walk, Chicksands, Shefford, Bedfordshire, SG17 5TQ by 5 pm on Wednesday, 24th April 2013. Applications to vote by proxy at this election applied for on grounds of physical incapacity, where that physical incapacity occurred after 5 pm on Monday, 25th March 2013, must reach the Electoral Registration Officer at Priory House, Monks Walk, Chicksands, Shefford, Bedfordshire, SG17 5TQ by 5 pm on Thursday, 2nd May 2013. The persons above, where no entry is made in the last column, have been and stand validly nominated. that due to the resignation of Mark Tomkins, a vacancy has arisen in the Office of Councillor for the Parish Council. If by 25 March 2013 (14 days after the date of this notice) a request for an election to fill said vacancy is made in writing to the Returning Officer at the address below by TEN electors for the said Parish, an election will be held to fill the said vacancy, otherwise the vacancy will be filled by co-option. If an election is called, it will take place not later than 31 May 2013. Totternhoe Parish Council is holding their meeting on Tuesday 19th March next and in attendance at this meeting will be Inspector Jim Hitch. He was invited to attend because the Parish Council wishes to raise policing issues within the area. If you are interested in attending this meeting; it will commence at 7.30 pm on Tuesday 19 March 2013, at Totternhoe Memorial Hall, Castle Hill Road, Totternhoe. If you have a question that you would like to raised with Bedfordshire Police, then please come to the meeting. You are viewing the March 2013 archive.